Besides the stress that comes with making a purchase, creating a unique space to call your own is one of the most exciting prospects of owning a home. Once you start getting stuck into to personalization of your place, you will start to transform your home into an extension of you. While picking the perfect spot for your sofa does wonders for the feng shui of a room, exploring the possibilities presented by your garden is a wonderfully exciting venture. You may not have the space to create an elaborately curated vegetable patch, but even the smallest of gardens can be immaculately curated. With just a pallet and a few plants, you can cultivate a delightful mini-garden. And, what better way to populate your garden than with a few essential healing herbs. Herbs host an array of health benefits are packed with flavor to enrich each dish and offer vitalizing properties for the body. To improve your overall health and energy, start growing a few of the herbs we have outlined below. Partner these with a quality health supplement and you will be well on your way to a more nutritionally enriched life. You can click here for more info about the latest supplements on the market and ensure that you make an informed purchase. Why Should I Grow My Own Healing Herbs? Herbs have been used for thousands of years because of their healing properties. They can be added to food for nutritional support, used to make nourishing homemade skin care products, and tossed into teas for an energy boost. Beyond these health benefits, growing your own herbs can be an exciting activity to share with your kids. Looking after plants teaches young ones responsibility and the value of life. Furthermore, herbs are resilient, extremely easy to care for, and exceptionally affordable. Basil is packed with flavor and features in cuisines across the world. It is one of the key condiments used in fish and pasta dishes. Though it is delightfully delicious, it also brings many health benefits to the table. Basil is known for its ability to stimulate the circulatory system. In doing so, it boosts concentration and promotes memory retention. Basil is a natural digestive aid, helping alleviate nausea and gas. It also works by inhibiting bacteria that is resistant to certain antibiotics. As a result, it supports the immune system and prevents infection. Basil can be consumed in a variety of ways. Simply chop some up and toss it over your food or prepare it in a warm cup of tea. Adding Lavender to your mini-garden will give it a lovely, fresh smell. Though inhaling the gorgeous Lavender scent is unlikely to offer health benefits, infusing it in a hot cup of tea can do wonders for the mind, body, and soul. Lavender is a calming ingredient that can be used to alleviate sleep disorders. It has antiseptic properties and consuming it through a tea can ward off harmful bacteria. It is also a natural antispasmodic and, thus, supports digestive health. A couple sips of Lavender tea will help reduce bloatedness, cramps, and nausea. Thinking of cooking up a curry? Then cilantro is the garnish you’ve got to go for! This powerful herb has a distinct flavor that will enrich each dish you add it to. 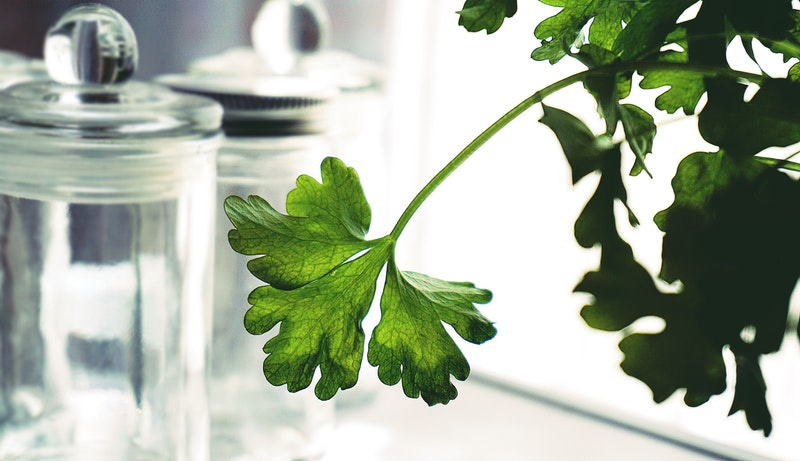 Beyond its taste appeal, cilantro is extremely beneficial for your health. Cilantro is argued to be an effective chelator. A chelator is a substance that binds with heavy metals and helps the body excrete them. In doing so, it can detox the body of harmful toxins. It is also argued to balance blood sugar levels and can, thus, be used to manage diabetes. Your best bet is garnishing your food with cilantro or adding it to a healthy, green juice. Rosemary is a beautiful and fragrant herb that will do wonders for your health. One of the most impactful benefits of this herb, when consumed with food, is that it can reduce the growth of pathogenic bacteria without eliminating good bacteria. Distilling fresh Rosemary into an oil provides further health benefits. Rosemary, when applied topically, can be a beneficial antiseptic and antimicrobial. In saying so, this wonderful herb can be used to alleviate eczema, acne, and oil imbalances. You can also use it as a hair mask to nourish your locks. These are just a few of the many herbs that offer an abundance of health benefits. Adding these four to your mini-garden is a great place to start and is bound to support you and your families health. Start enjoying the benefits of these herbs by growing your own!